Personalised driving lessons in Newcastle, Wallsend, North Tyneside, Sunderland, South Shields, Whitley Bay & Gateshead… Designed to SAVE YOU MONEY! We listen. We tailor. YOU PASS for LESS. 2 Hours PLUS 2 Free Only £39.99! 8 Hours PLUS 2 Free Only £175! 4 Hours PLUS 1 Free Only £99.99! 8 Hours PLUS 2 Free Only £199! Book with us TODAY and start lessons ASAP! Aspiration Driving School Newcastle is different, our driving lessons (beginner / advanced) are tailored to your individual needs. Our DVSA approved driving instructors will adapt your tuition so that you get the best quality training and value for money. It means you take your test when you’re ready. It means there are NO wasted lessons, NO wasted test fees and NO hassle! We offer a full range of driving tuition to ensure you are a skilled driver in all situations and conditions. All our driving lessons are backed by our Pass Promise, Money Back Guarantee and our Warranty. Aspiration Driving School is very serious about providing the best quality tuition and teaching safe driving for life BUT we’re friendly, approachable and have a sense of humour! Book with us TODAY! Limited Spaces! We’re a friendly bunch… Call us on 0191 500 9775 (24hr service) and start your journey! Or message us below! This is a unique warranty – we are the ONLY driving School in the North East to offer this! The Aspiration Driving School warranty offers you a FREE refresher lesson* within two years of passing your test! Perhaps you’ve just purchased your brand new car and want a refresher on reverse parking, or you’re travelling a long way and would like motorway tuition for added confidence. It’s your choice how and when you use it! We see it as doing our bit to promote safe driving and offer you great value for money. * This entitles you to 1 hour per year over 2 years, or as agreed with your driving instructor. We promise to go above and beyond to ensure our high pass rate isn’t because we select drivers based on ability BUT because of our quality tuition and good judgement on when you are ready to take your test. 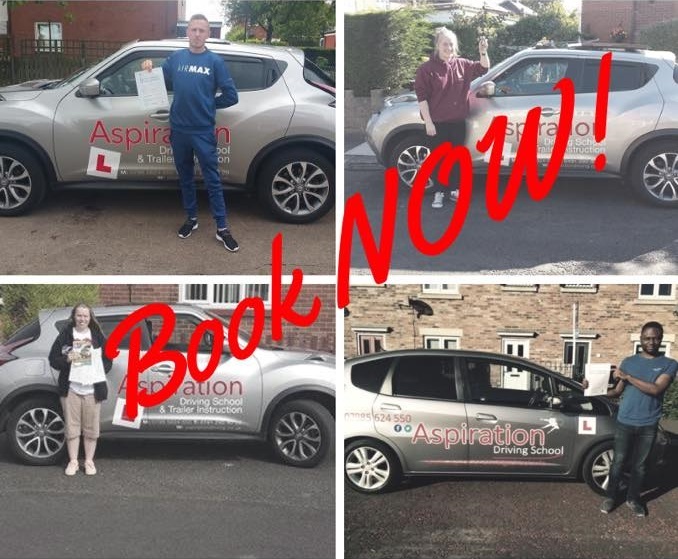 If you’re a nervous driver you need Aspiration Driving School with our pass promise and 100% commitment to help you pass your in the minimum number of lessons to achieve test standard. It rarely happens but to offer you complete reassurance in booking a driving lesson with us, we offer a FULL money back guarantee! So, if you are not happy for any reason then let us know before the end of your lesson and we will refund* you the money. * Note any issues need to be raised before the end of your lesson to be eligible for a refund. We will refund in full any future lessons booked. We’re not a large national driving school and as such we can offer a tailored driving service. Our approach has proven to deliver a high pass rate meaning you’re not wasting money on failed tests and additional lessons. Our instructors deliver quality training and are completely focused on teaching safe driving for life. I was really nervous but quickly put at ease meeting John. He’s very patient and I doubt I would have passed fist time using anyone else. Thank you – I now have confidence and independence! I would of course recommend Aspiration to anyone they are superb! When you’ve decided to take the plunge and start driving we can help you pass your test. You may want your licence for social reasons, family or to help your career. Regardless, our tailored tuition all backed with a triple warranty provides a first class learner driving service that you can afford. For whatever reason you’ve had to ditch your driving lessons in the past we can help. We will assess your ability and plan exactly where to restart your lessons. This may not be from the beginning saving you time, money and hassle. Aspiration Driving School helps people of all ages to pass their driving test. So you’ve passed your test but have perhaps had a break and need to get back behind the wheel. Or, you are nervous about any aspect of driving we can help. Our refresher lessons are designed to inspire confidence through safe driving. We will get you back on track and feeling great about your driving. If you have failed your driving test, you are likely to feel disappointed as well as out of pocket. We will help you with our driving test rescue plan to get you back on track, focussing on the areas that prevented you from passing with a previous school. We concentrate on your driving confidence as well.